A new era is starting at Audi Hungaria. On Tuesday, series production of electric motors officially started in Győr. 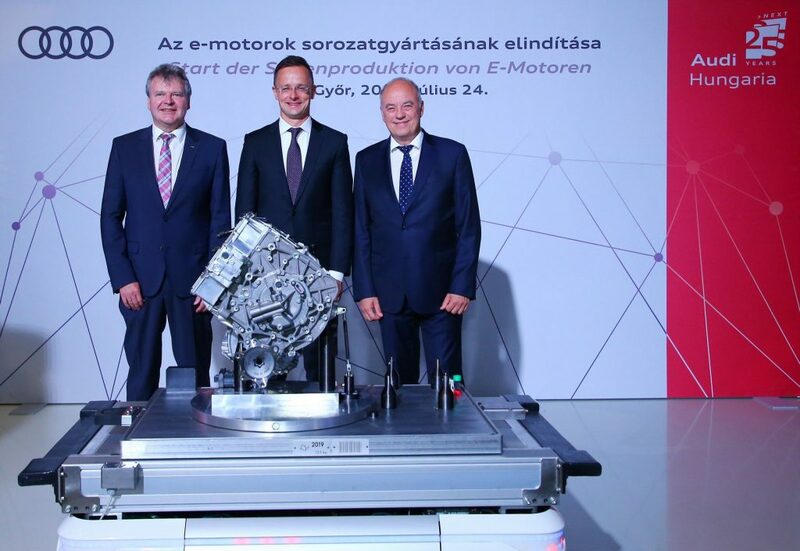 In the context of the symbolic act, the production plant was put into operation by Péter Szijjártó, Minister for Foreign Trade and Foreign Affairs, Peter Kössler, Board of Management Member for Production and Logistics at AUDI AG, and Achim Heinfling, Managing Director of AUDI HUNGARIA Zrt. The electric motors are produced on floor space of 8,500 square meters with an innovative production concept: modular assembly. The company has invested a double digit million amount to set up the motor production facility. Approximately 100 people are employed in this new area at present. “Audi Hungaria has been involved in writing the growth story of the Four Rings for 25 years. Our Hungarian subsidiary is now entering a completely new field of expertise with the production of electric motors. This exclusive know‑how makes Győr into our main plant for electric motors and embodies our strategic transformation into a provider of sustainable mobility,” stated Peter Kössler, Board of Management Member for Production and Logistics at AUDI AG, during the symbolic act.“Audi Hungaria is taking on a pioneering role in the production of electric motors. I am proud of our employees’ high levels of expertise and motivation. 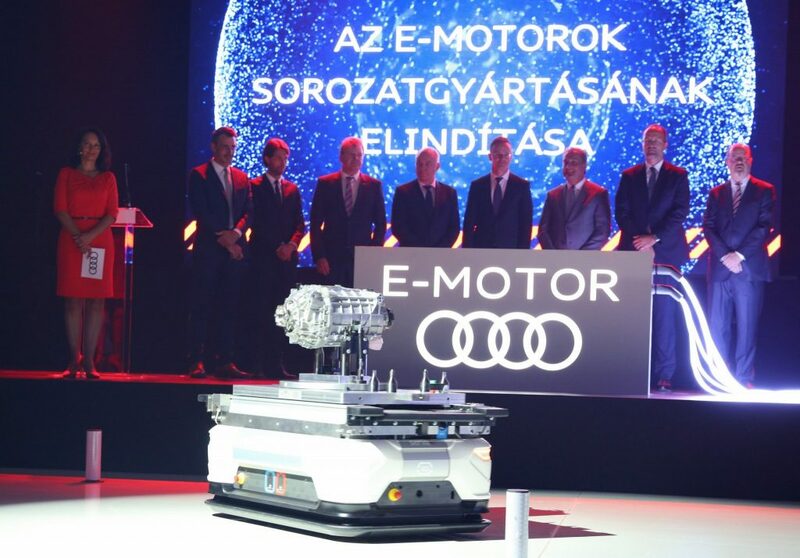 They have successfully started the production of our new electric motor with great commitment,” said Achim Heinfling, Managing Director of AUDI HUNGARIA Zrt. The first electric motors from Audi Hungaria will be used in the Audi e-tron. It is the first all‑electric Audi model and will be built at the Audi plant in Brussels. For the production of electric motors, Audi Hungaria installed the innovative production equipment and islands within just one year. The departments for the development of electric motors and for production planning cooperated closely with the prototype manufacturing/ production technology center in Győr to develop the required expertise. The current production capacity is for approximately 400 electric axle motors each day and can be gradually increased. At present, about 100 people are employed in this new area, to be increased to more than 130 by the end of the year. Production is with one‑shift operation, but will soon change to three shifts. The electric motor from Győr offers numerous new features. With the stator – one of the core components of the motor – the aim is to insert as much of the thin enameled copper wire as possible into the casing: the tighter the winding, the more efficient the power delivery. 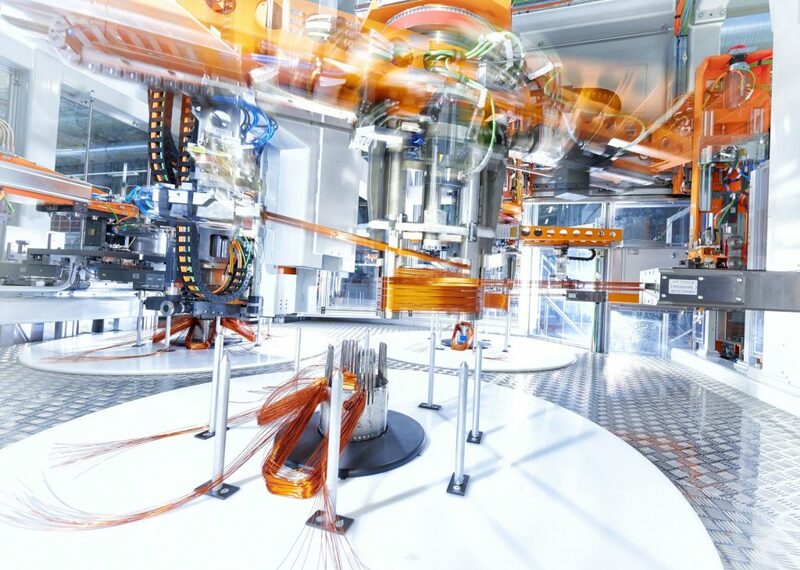 A new winding and inserting center at Audi Hungaria makes it possible to wind the optimal amount of enameled copper wire particularly compactly and then insert it into the casing. The electric axle consists of other large components such as the power electronics, which are located in their own housing, the gearing and two flange shafts that transmit the power to the wheels. 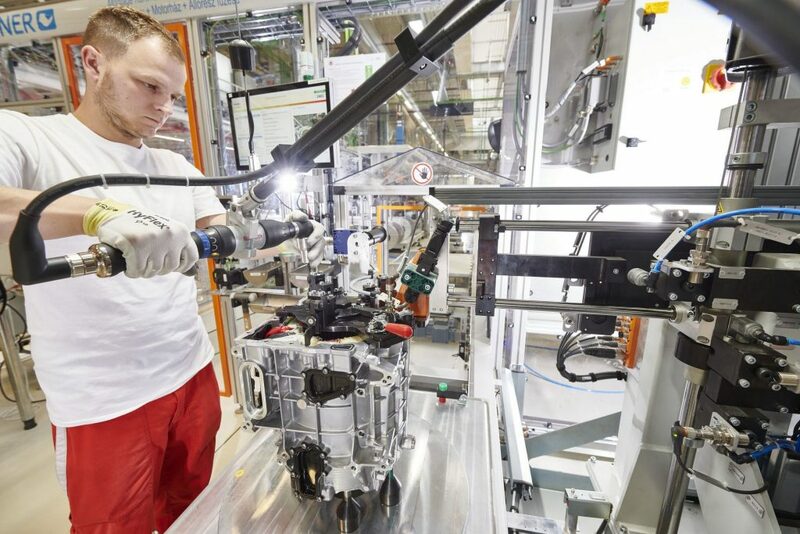 The employees produce two electric axle drive systems for each Audi e-tron, as both the front and rear axles are driven – in good quattro tradition. The production equipment, the robots and the bolting and measuring station are set out in fixed positions but are not linked together by a linear band. Instead, the employees produce the drive systems according to a modular method in production islands. Despite a predefined assembly sequence, the modular system allows branched paths and more free scope in the production process. Driverless vehicles, controlled by an intelligent IT system, transport the parts to the workstations. 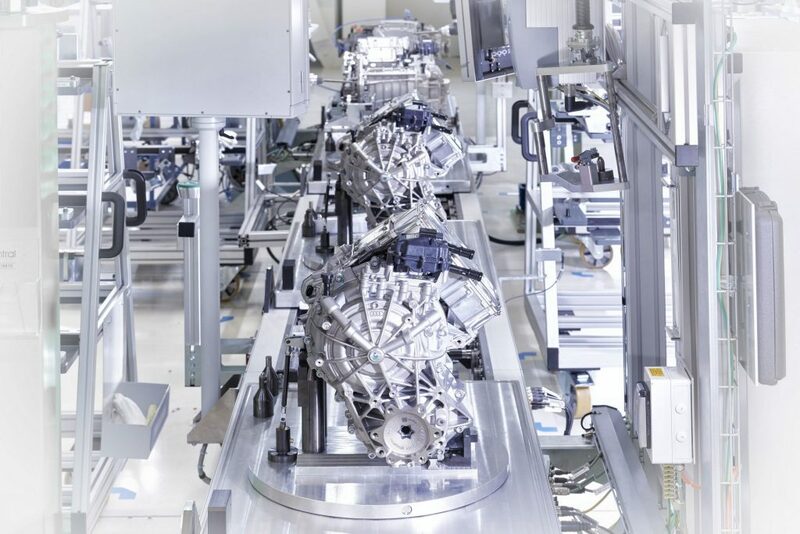 In parallel to the production facility, Audi Hungaria has installed three test benches for electric motors in the engine/motor development department, for testing and continuous load operation. The employees have undergone further training to become electrical experts in the production technology center for electric motors. Audi Hungaria produced 1,965,165 engines last year, making the company one of the world’s largest engine producers. At the plant in Győr, six different gasoline engines and three different diesel engines were produced in 2017 with power output ranging from 63 kilowatts (86 horsepower) to 470 kW (639 hp). Approximately 6,000 employees produce about 9,000 engines each day for 32 production plants of the Volkswagen Group.